This sounded fun, but I did struggle with it to begin with. It developed into a good read though once I got to grips with the story and I look forward to more from Leila and co.
Its a great read, full of fun and interesting characters, a neat plot that lets the reader learn more about them in a show not tell way – I hate books which just tell us about characters, I want to learn about them from their experiences, and that’s done perfectly here. 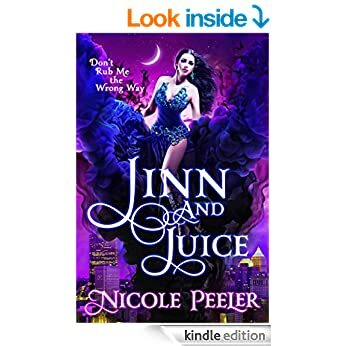 There’s magic and fun, danger and disasters, and all the while the battle to get everything sorted in time so Leila can be unbound and become human, or else she faces another thousand years as a Jinni. There’s some hard decisions to take, some issues with trust and all the while we can feel a simmering attraction between Leila and Oz. I really liked him, and the way he was strong when he needed to be, not afraid to take advice and how he felt for Leila was very clear, and yet he was so honourable he wanted to ensure it was her that wanted him and not the Jinni….Sadly there are some real surprises for all of them, and things happen that leave them all facing death. Its a fun read, a race against time, full of magic and mayhem and I look forward for more from the crew. Stars: Four and a half, a slow start but a read that proved to be full of future promise.